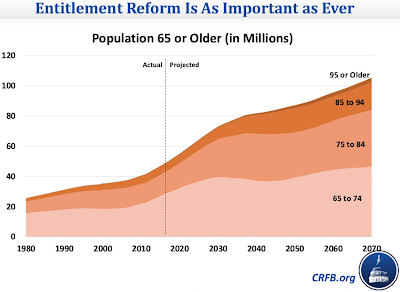 While Capitol Hill's denizens frequently discuss how their budgetary changes are going to impact the taxes paid by Main Street and Corporate America, they rarely mention the impact of these changes on the entitlements that most Americans feel are their birthright. This is particularly the case for the nation's Social Security system, a key part of retirement funding for tens of millions of Americans. Thanks to the Committee for a Responsible Federal Budget (CRFB), we have a glimpse into what lies ahead for this key aspect of life in the United States. 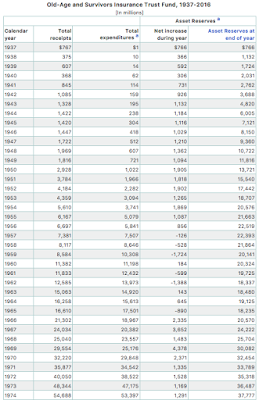 As you can see, the number of Americans 65 years of age and older is projected to more than double from around 50 million currently to over 100 million in 2070. Obviously, this is going to put a strain on age-based entitlement programs. 1.) On a combined basis, the Old-Age, Survivors and Disability Trust Funds (OASDI) face a theoretical 75 year shortfall of 2.83 percent of taxable payroll or 1.01 percent of Gross Domestic Product and will be insolvent by 2034. 2.) 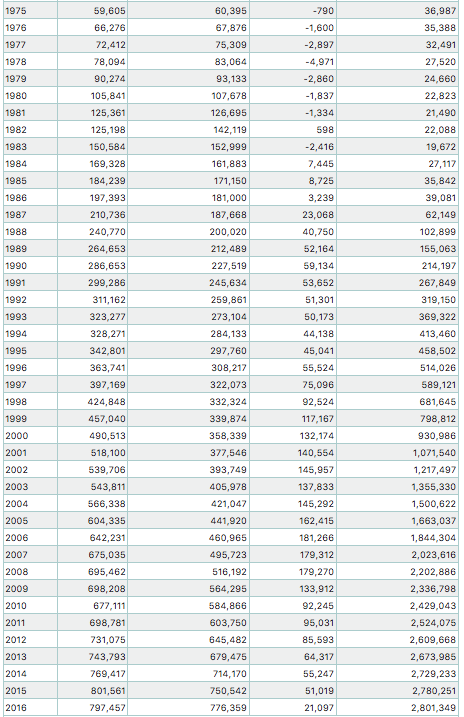 Social Security will pay out $27 billion more in benefits than it receives in tax revenue this year. 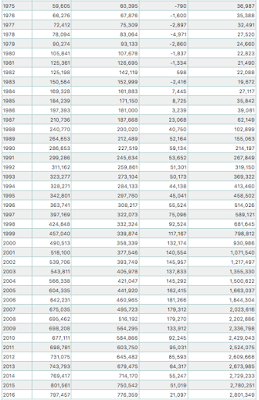 Social Security deficits will reach 1.36 percent of GDP by 2037 and 1.54 percent of GDP by 2091. 4.) On a present value basis, the program's 75 year unfunded obligation will reach a total of $12.5 trillion. a.) 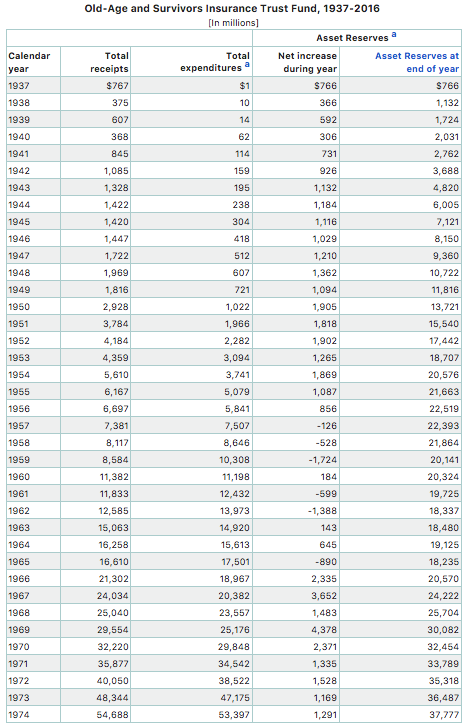 Newly retired 62 year olds (in 2017) would see a cut in benefits of $3700 per year in 2034. b.) A beneficiary that reached full retirement age (67) in 2033 will see a cut in benefits of $5800 per year (in today's dollars) in 2034. 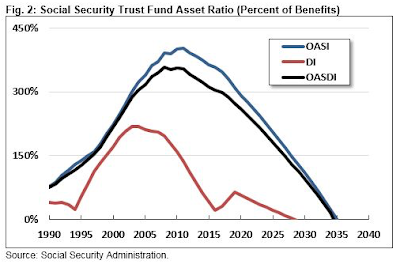 With a significant proportion of state and private pension plans underfunded and the funding issues facing the Social Security scheme, it is looking increasingly like the pension Ponzi scheme has finally reached the point where it will collapse under the weight of the aging American population. 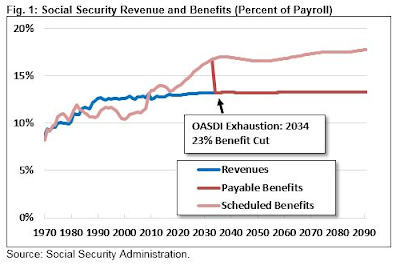 If Congress hopes to achieve any sort of fiscal balance in the Social Security scheme, they will have to act quickly to phase in either cuts in benefits, increases in payroll taxes or some combination of the two. 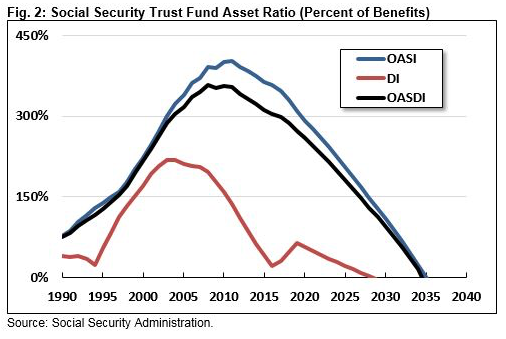 The longer that Congress waits to take what will surely be unpopular action on the looming Social Security time bomb, the worse the situation will become. Instead of focussing on this issue that is of great importance to the vast majority of Americans, Congress seems to be focussing its energies on the current Donald Trump reality television show that has taken over Washington since the 2016 election. Other then the issue of age, this disingenuous article address none of the many issues addressing who, and under what circumstances, is provided SS benefits. This article is a set up to increasing SS contribution, using the reduction of benefits as a club. If one wanted to qualify for SS disability you need to look 5 major symptoms of depression. Remember, practice, and regurgitate them during your 10 minute interview, with a social worker, holding nothing more than a Bachelor or Masters degree. For depression, the phase "I have an incredible eager to sleep" gives you big points.